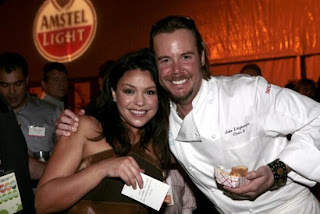 Rachael Ray's first duty at the Food Network sponsored South Beach Wine and Food Festival was to host the Amstel Light Burger Bash. The event pitted teams against each other to determine who had the best burger in the land. As you may recall, Rachael is the self-proclaimed Queen of Burgers, so this was the perfect event for her to host. Eater informs us that the winner of the Burger Bash (drumroll please) was New York City's Shake Shack. Other participating teams included BLT Burger (New York), Chair 8 (Telluride, CO), City Hall (Tribeca, NY), Clarke’s (Miami Beach, FL), David’s Café (Miami Beach, FL), DB Bistro (New York, NY), Envy Steakhouse (Las Vegas, NV), and Father’s Office (Santa Monica, CA). You can see a full list of participants here. It looks like a story featuring the winner will be in an upcoming issue Every Day with Rachael Ray. I found the photo above at Yumsugar and they've got more of them for you to look at, too! Anyone else looking forward to Rachael's future burger joint, or is it just me? Gag-another RR venture. Don't you think that people will get sick of her soon. Garrett: I had to go to In n' Out after writing this post. Anony: In a word, no. And if you are sick of her, I suggest avoiding blogs named "Everything Rachael Ray."